Here is a valve with infective endocarditis. The blue bacterial colonies on the lower left are extending into the pink connective tissue of the valve. Valves are relatively avascular, so high dose antibiotic therapy is needed to eradicate the infection. 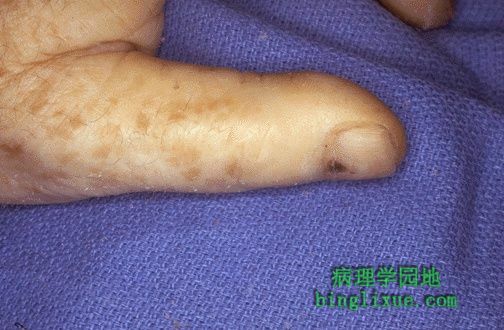 Another small linear splinter hemorrhage is seen here subungually on the left thumb of a patient with infective endocarditis and blood culture positive for Staphylococcus aureus. Here is another marantic vegetation on the leftmost cusp. These vegetations are rarely over 0.5 cm in size. However, they are very prone to embolize. 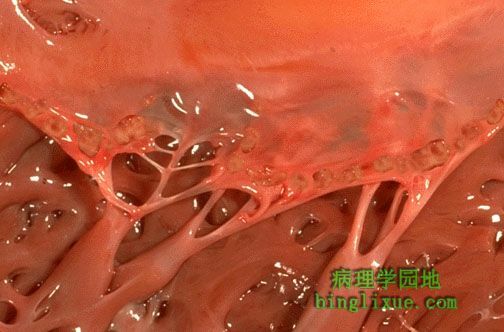 The small verrucous vegetations seen along the closure line of this mitral valve are associated with acute rheumatic fever. These warty vegetations average only a few millimeters and form along the line of valve closure over areas of endocardial inflammation. Such verrucae are too small to cause serious cardiac problems. The heart has been sectioned to reveal the mitral valve as seen from above in the left atrium. 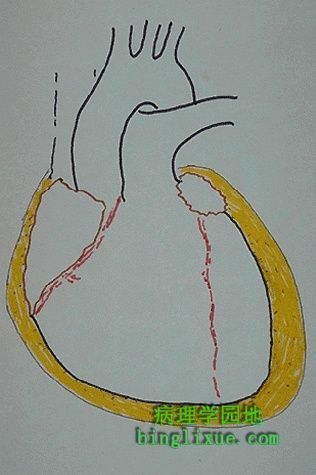 The mitral valve demonstrates the typical "fish mouth" shape with chronic rheumatic scarring. 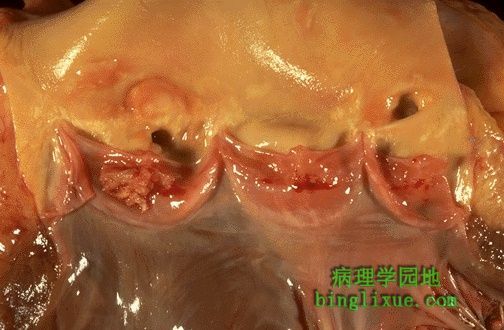 Mitral valve is most often affected with rheumatic heart disease, followed by mitral and aortic together, then aortic alone, then mitral, aortic, and tricuspid together. 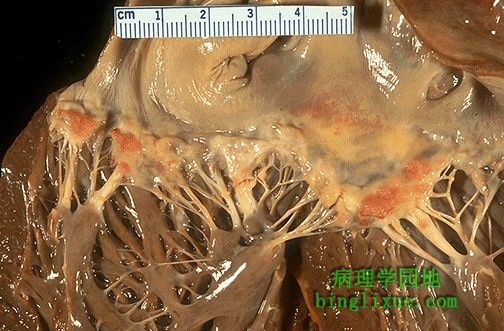 This diagram depicts the appearance of a serous pericarditis. 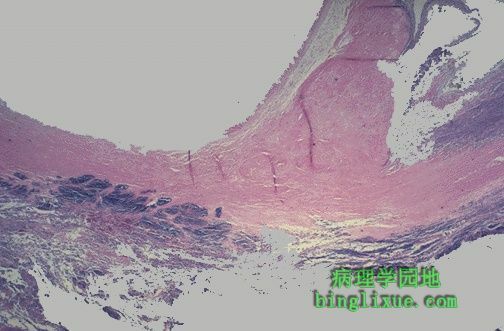 The amount of inflammation is minimal, so no exudation of fibrin occurs. 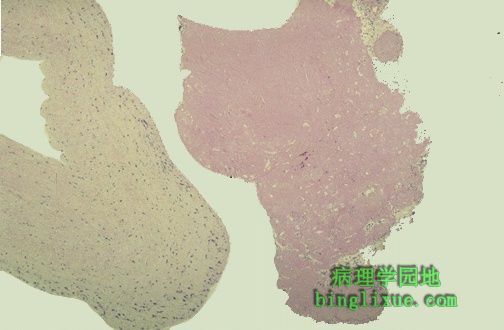 The dark stippled dots in the yellow fluid and on the epicardial surface represent scattered inflammatory cells. 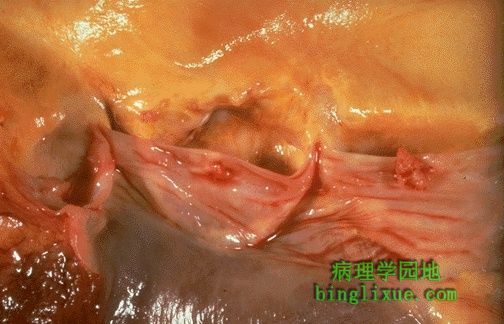 Serous pericarditis is marked by fluid collection. Rarely, the fluid collection may be large enough to cause tamponade.